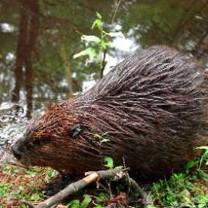 The largest rodent in the US is an industrious builder of dams to maintain a deep pool around its lodge made of branches sealed with mud and rising above the water. The lodge provides protection from predators and weather and acts as a nursery for 1-6 kits, who stay with the parents until 2 years old. They are active at night, climbing up stream banks in search of leaves, twigs, the inner bark of sapling trees, and herbaceous plants to eat. Their main predators are the bobcat and the coyote. 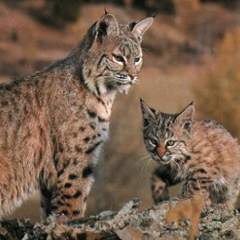 The most abundant wild cat in the United States can be seen in a variety of habitats from upland forests to coastal swamps, preferring areas with extensive thickets or dense shrubs. 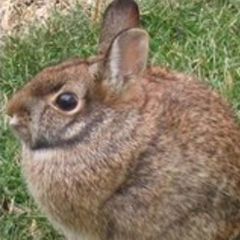 They hunt at night for rabbits (50% of its diet). 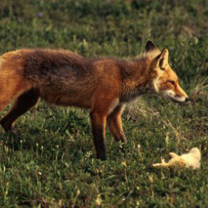 Rodents, birds, and young or sick deer are also eaten. 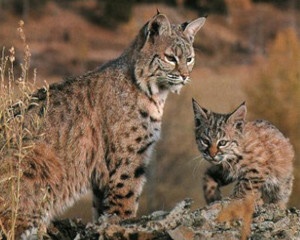 The bobcat may have several dens in a hollow logs or rocky crevices. The most widely hunted game animal by humans in the eastern United States is also taken in large numbers, despite its speed, by foxes, bobcats, hawks, owls, and large snakes. Female have up to 7 litters a year with 3-5 young. 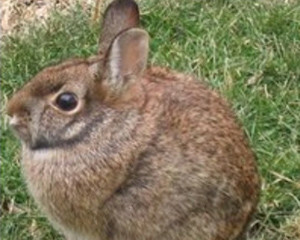 Eastern cottontails eat a wide variety of plant materials including small trees and garden vegetables. They are found in or near habitats with mixtures of herbaceous and shrubby plants. Wild pigs, or feral hogs, are usually nocturnal and will seek areas that will give them access to almost anything that has nutritional value, including tubers, roots, acorns, fruits, earthworms, amphibians, reptiles, rodents, and even newborn deer fawns. Humans are their major predators. 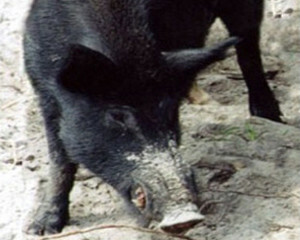 Hogzilla, a wild pig, gained international attention after it was shot in Georgia in 2004. It was alleged to be 12 feet long and weigh 1,000 lbs. 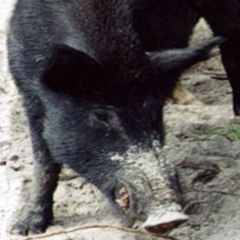 Piglets may be preyed upon by bobcats, foxes, and coyotes. 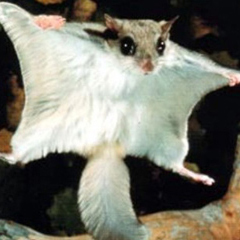 This squirrel travels from tree to tree by leaping into the air and, buoyed by its outstretched gliding membrane, can easily soar 20-30 feet (100 ft. glides are possible). Daytime feeding includes acorns, nuts, fruits, seeds, blossoms, insects, birds, and eggs. 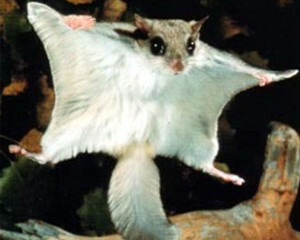 It lives in forests where there are many old trees with natural cavities or woodpecker holes. 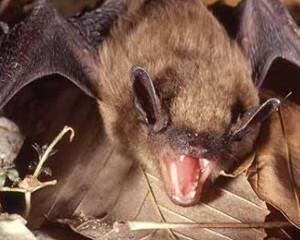 Nests are usually built in trees cavities as high as 40 ft. where the young are born. Roosting in colonies of up to several thousand this small mammal chooses sites such as attics or caves in summer and migrates up to 300 miles to hibernate in winter. 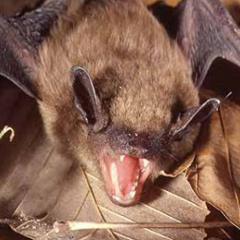 In flight at night bats catch insects such as mosquitoes (500 per hour). The females form large maternity colonies in the spring; each usually has one offspring. The only marsupial in North America is like its Australian cousin, the kangaroo, in that it spends the early months of life in the mother's pouch. 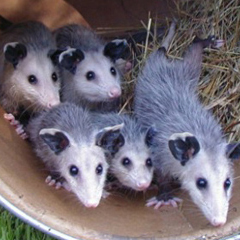 Opossums like to live in forests, brushy areas, and farmland and are active at night, feeding on insects, birds, small mammals, berries and other fruit, and corn. It lived during the age of dinosaurs as long as 70 million years ago. 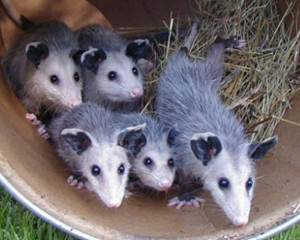 When opossums are attacked, they will act as if they are dead. 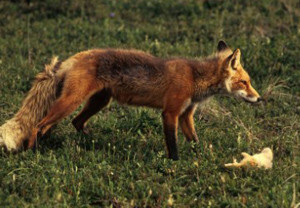 Predators include foxes and dogs. 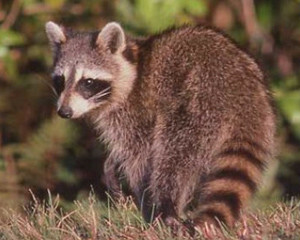 Native only to the Americas, the raccoon is nocturnal and often solitary but will join dens of over 20. 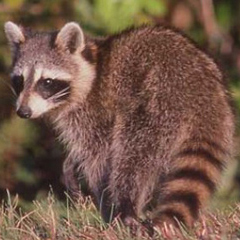 Foxes, bobcats, coyotes, owls, and other predators kill many young raccoons, but the automobile, disease, accidents, and human hunters are more likely cause of death. Raccoons eat fruit, nuts, berries, grubs, grasshoppers, and crickets, small mammals, bird eggs, and nestlings as well as frogs, worms, fish, clams, turtles, and turtle eggs, but they can survive the entire winter without eating. Their nimble fingers can easily turn doorknobs and open refrigerators. Wooded areas, prairies, and farmland are home to the red fox where they eat a wide variety of foods, including fruits, berries, grasses, small mammals, crickets, caterpillars, grasshoppers, beetles, and crayfish. They are mostly nocturnal but will sometimes venture out during the day. 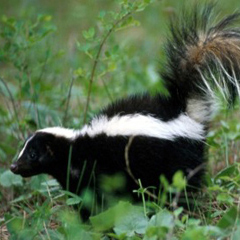 The skunk’s bold color lets enemies know not to bother it or it will release a foul musk spray up to 15 feet; the smell may carry a mile. Spray in the eyes causes intense pain and fleeting loss of vision. The only serious predator of the skunk is the great horned owl. 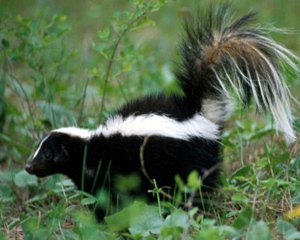 Skunks are primarily nocturnal, survive in a multitude of habitats, including populated areas, and feed heavily on a wide variety of small animals, eggs, insects, spiders, bees, ants, and fruit. 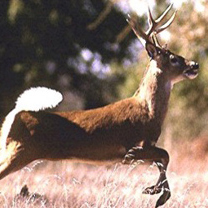 Found in all habitats, but deer are most likely found in forests, fields, and crop lands, feeding on leaves, buds, twigs, acorns, fruits, corn, soybeans, and many other plants. 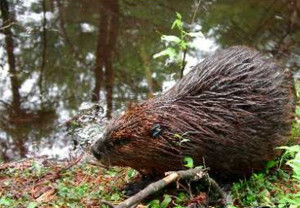 They are active at night but are often seen during the day. 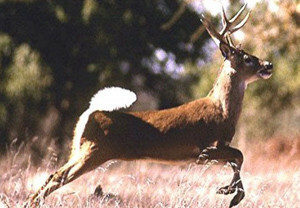 Hunters are the predominant predators, but many deer are killed by cars. Natural predators are bobcats and coyotes.